Edo means estuary and is the old name for Tokyo. During the Tokugawa Shogunate, which ruled Japan from early 1600's to late 1800's. 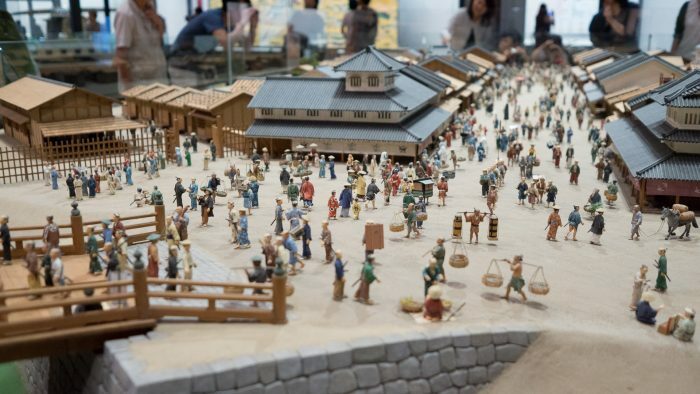 Edo was a thriving, bustling and most likely dangerous place. This rather brutally ugly 90's museum documents this period and much more upto present day Tokyo. Ugly on the outside its pretty amazing on the inside with immaculate scale models of early Edo life and real live scale buildings from the latter period of Edo. Its well worth a visit to bone up on your Japanese history and to see some amazing artifacts. There was also an exhibition about Yokai - ghostly creatures used to explain unexplainable daily events - while I was visiting. Yokai are widely thought to be the precursors to many games such as Pokemon and are key in Japanese folklore. Fascinating stuff and another real insight to the Japanese mind. As if I needed anymore ! Read more about the museum here. And you can see a few extra pics here.